Will this trigger fit the TP9SFX? Not evenly remotely close. We are working on a design for the SFX/SF/SA though. No worries we're on it! We'll offer installation in house as well. It will be a $40 flat labor fee and you pay shipping both ways. Springs are getting sent off next week for spring kits and we'll start designing the guide rod as well. Mag Extensions are live on the website. That will probably be the next SAR we get into. Listing for the Arminius is live now. Getting the listing built as we speak for the website. We should have them up sometime next week for sale. Just the safety blade version. The original SA with the decocker and non safety trigger you want the Jefe for the V2/DA Gen 1. It doesn't have the safety blade needed for the SFX. Don't worry the trigger for the SF/SFX/SA is almost finalized. Topic: SAR9 Optic Mount Design. 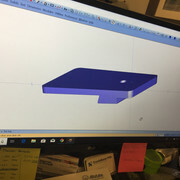 Initial optic mount plate design. Should be up on the website in the next week or two. Just got to get pictures taken and the listing built. I'm not a fan of the trigger or its shape. Any plans to upgrade or replace it? Ok just heard that, YES! Sign me up when they are ready to go. @GallowayPrecision, any plans on a replacement trigger?